The Station Fire began on August 26, 2009, and burned for several weeks, consuming a massive 160,000 acres of the Angeles National Forest. Following an intensive restoration effort, major roads across the forest were reopened on November 30, 2009. 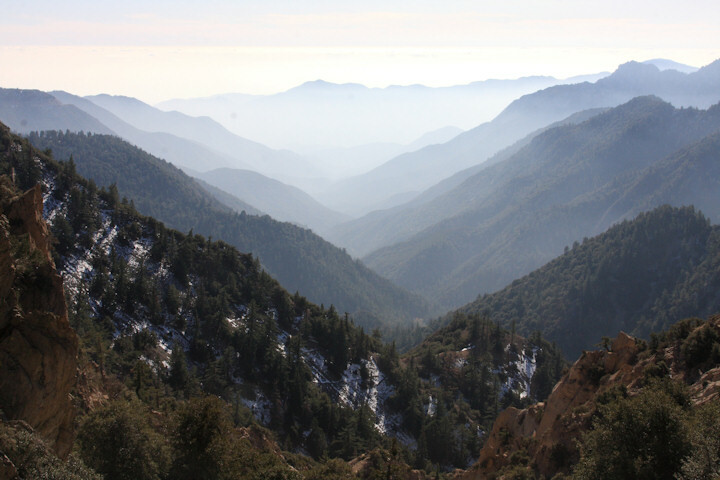 Some roads were again closed from December 6th because of an impending winter storm; but before that, on December 2nd, a few of us travelled across the San Gabriel Mountains to see what the forest looks like after the fire. This gallery page is the result. Although the fire was extensive, there is an island of unburned country around Chilao Visitor Center. Another favorite location, Buckhorn, is untouched. All of the areas along the northern section of Angeles Crest Highway from Cloudburst Summit to Big Pines did not burn, and remain as they were. Not only did we see the burn areas, but we were rewarded by the beauty of the first winter snow in the higher elevations. Those areas did not burn, and the drive served as a reminder of the significant role played by snowfall in this dry climate. Approximately 3 inches of snow fell on the Sunday prior to our Wednesday drive. This is just a fraction of the approximately 100 inches of snow that fall in a typical winter in the San Gabriels. Our drive took us from La Cañada Flintridge north across the Angeles Crest Highway to Big Pines, then back south and westward across Upper Big Tujunga Canyon Road, and all the way down Big Tujunga Canyon, returning to civilization at Sunland. All of the following photos, except the last one, were taken north of Dawson Saddle on the Angeles Crest Highway. South of that point, few places with good snow were convenient for stopping to take a photo because the road had not been cleared there, presumably because the concentration in that section of the highway was on restoration after the fire, not on promoting recreational driving.